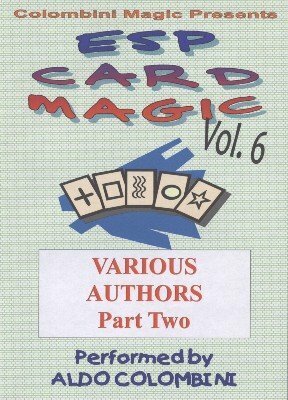 This is the sixth in a series of download DVDs dedicated to tricks and routines using ESP cards. This volume 6 features routines by a range of famous authors. QUINTUPLICATE COINCIDENCE (Arthur Carter): The deck is shuffled and dealt into five packets. Five cards are placed as predictions. Five spectators shuffle each packet and pick a card each: They match the prediction. MENTAL TEKEL (Max Maven): A spectator freely picks a card from a red-backed deck. Your blue-backed card matches the selection. A CUT ABOVE (Marcello Truzzi): A 'paper sleeve' containing a piece of paper with five ESP symbols is cut at random by a spectator cutting through an ESP sign (free cut). It matches the previous sign selected from a packet of cards. Great method. Great routine. ESP FOOL'S MATE (Nick Trost and Aldo Colombini): You place a red-backed card on the table (say the Cross). A spectator freely selects a card from a packet and this card is a Square. You show all the other cards being Crosses. Finally, the red card changes into a Square. KLONDIKE ESP (Werner Miller): From a shuffled deck one card is placed aside and two spectators place pairs of cards on the table. Only two pairs match with the single card (e.g. all Stars). ESP, MAGIC OR COINCIDENCE? (Paul Hallas): Eight cards are shown and shuffled. Three spectators pair the cards by using the words ESP or MAGIC. MAKING THE POINT (Karl Fulves): Using two regular dice, a spectator finds two matching pairs from a shuffled deck. ESPIAL (Aldo Colombini): A combination of ESP cards and a regular deck of playing cards with a strong prediction with two cards having a Square and a Circle cut-out in the middle. Novelty effect. EITHER/OR (Stephen Minch): Two spectators pick a card using a freely chosen number and you can immediately name the two symbols chosen! Clever subtlety. VISION ESP (Armand Porcell): The deck is riffle shuffled (even by a a spectator) and five cards are taken. You immediately name them.